Yes that’s right ‘Bathtub’ beard oil and no The Beardy Beard Co Bathtub Beard Oil doesn’t smell like a product you would use in the bath! In fact it has been named Bathtub as it has been blended like a spiced gin and many years ago they would use the water from the bath as the large pots would not fit under the tap in the sink! The scent blend is Juniperberry, Neroli, Cardamom, Coriander and Cinnamon leaf essential oils. I have been very undecided about this scent, it has a lovely citrus sweetness and then the spice comes through. I am not a fan of Cinnamon leaf and Coriander as they have the same note as Clove, but in this scent blend it works well. But I am unsure if I like it or not and I don’t think I have ever been in that situation before? However, I can appreciate the scent, it has been beautifully blended and it is certainly created from thinking outside of the box. So many brands all stick to the same old scents and so when you get something like this, you appreciate it and that is why it got the highest score. The base for Bathtub oil as for all of The Beardy Beard Co oils is Jojoba Seed, Sweet Almond, Grapeseed, Hemp Seed and Vitamin E and it is a very nice blend. I have had some good beard days whilst using The Beardy Beard Co beard oils, my beard has felt soft and looked good. This is a brand worth checking out, based in Belfast, Northern Ireland the products are small batch and hand-made and have been assessed and approved for sale in the EU. 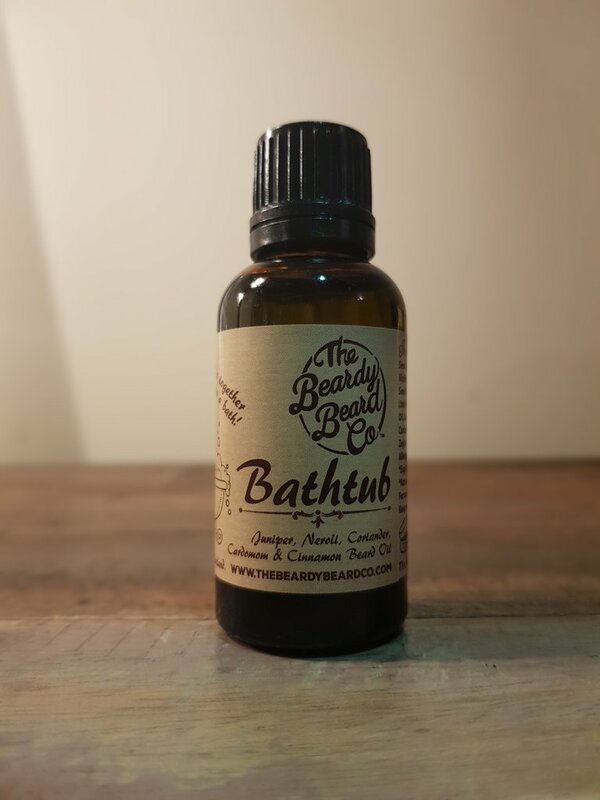 The Bathtub beard oil comes in a 30ml glass bottle with a drip stopper and costs £15 from the website.